Meet ullstein bild at the PICTAday 2019! We look forward to your visit at table 4. The revolution in the winter and spring of 1918/19 was decided in the streets of the imperial capital Berlin. On 9 November 1918, the Berliners celebrated the emperor's abdication with demonstrations in front of the Reichstag and the palace. In January 1919, the Spartacist barricades against the advancing government troops were erected in the newspaper district from rolls of printing paper. The press photographers were always there, photographing the speakers in the crowd, the soldiers behind the machine guns, the party carts for the National Assembly elections, the destroyed houses and devastated squares with their large plate cameras. At the same time, however, everyday life continued in the city, people visited the many cinemas with their expanding range of films, enjoyed themselves in revues and cabarets, danced two-step and foxtrot. The exhibition in the Museum of Photography shows both a photographic pictorial history of the revolution in Berlin and a panorama of the entertainment culture of these months. In the first days of the revolution, the brothers Otto and Georg Haeckel were the most important press photographers. As experienced war reporters, they accompanied the spontaneous rallies on Unter den Linden and in front of the castle. The photographers worked without commission and offered their photographs to publishers such as Mosse or Ullstein. There is little evidence of the fighting itself. Rather, the photographers recreated scenes with soldiers with guns ready to fire or at the barricades during the combat breaks. We are pleased to be able to enrich this exhibition as a cooperation partner with important exhibits from our collection. Exhibition catalogue Berlin in the Revolution 1918/1919. Photography, film, entertainment culture with contributions by Katrin Bomhoff, Ludger Derenthal, Evelin Förster, Karin Herbst-Meßlinger, Enno Kaufhold, Alan Lareau. The exhibition can still be seen until 03.03.2019 Museum of Photography. Further information on the exhibition can be found on the website of the Museum für Fotografie, some impressions can be seen in our collection. Thank you for the trustful and pleasant cooperation in 2018. We wish you a happy and successful New Year. Christopher Wool at work with "DIE WELT"
A newspaper as a collector's item: The American painter Christopher Wool has designed a complete edition of the WELT - on 14 December 2018 in stores. The result is uncompromisingly cool. The calendars of the ullstein bild collection can be ordered online here. Choose your favourite theme from the variety of our ullstein picture collection. For your desk, as a gift, as a desk or wall calendar, in various sizes and designs, individually for every purpose - and in very good print quality. Order now. Rebecka Kärde, 27, was appointed to the Nobel Prize Committee for Literature. 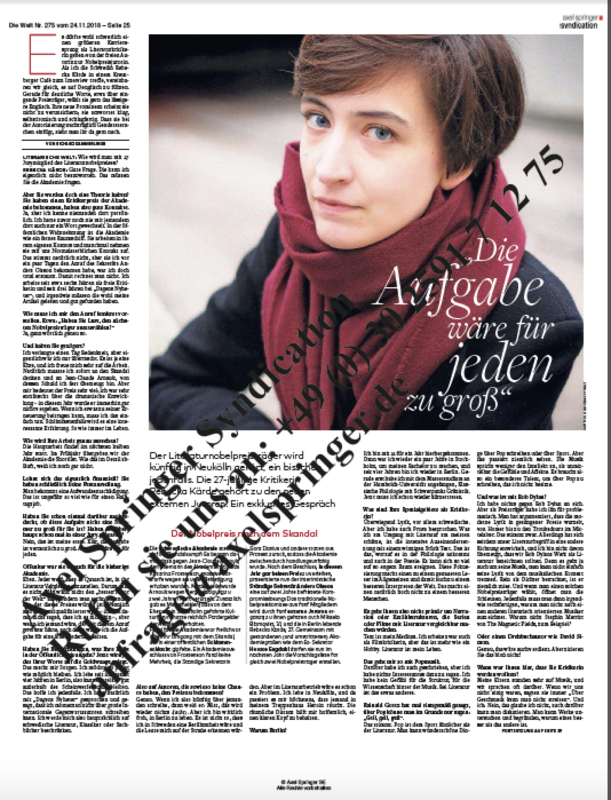 "This 27-year-old student lives in Berlin, works as a freelance journalist for Swedish newspapers and is now one of the jurors of the Nobel Prize for Literature. Rebecka Kärde herself was surprised when a phone call came from the Swedish Academy in Stockholm a few days ago. She doesn't lack self-confidence, and she says: "The task would be too big for everyone." We met her." Research or license this article with us. Exhibition "Berlin in der Revolution 1918-1919"
The revolution in the winter and spring of 1918/19 was decided in the streets of the imperial capital Berlin. On 9 November 1918, the Berliners celebrated the emperor's abdication with demonstrations in front of the Reichstag and the palace. In January 1919 the barricades of the Spartacists against the advancing government troops were erected in the newspaper quarter from rolls of printing paper. After the end of the fighting, the large funeral corridor moved across Frankfurter Allee to the cemetery in Friedrichsfelde. The press photographers were always present, photographing the speakers in the crowd, the soldiers behind the machine guns, the poster carriages of the parties for the elections to the National Assembly as well as the destroyed houses and devastated squares with their large plate cameras. But at the same time everyday life in the city continued, people visited the many cinemas with their expanding range of films, had fun in revues and cabarets, danced two-step and foxtrot. The exhibition will open on Thursday, November 8, 2018, at 7 p.m. in the Museum of Photography. Duration of the exhibition from 09.11.2018 to 03.03.2019. Further information on the exhibition can be found on the website of the Museum für Fotografie, some impressions can be seen in our collection at ullsteinbild.de. The Invention of Press Photography - From the Ullstein Collection 1894-1945. A joint exhibition by ullstein bild / Axel Springer Syndication GmbH and the German Historical Museum in Berlin from 23 June 2017 to 01 January 2018. The exhibition focuses on a historical turning point in the development of the German press landscape with the Ullstein press photo collection from the turn of the 20th century and the "Berliner Illustrirten Zeitung" (BIZ), published by Ullstein-Verlag from 1894 onwards. Using the BIZ as an example, the exhibition presents the photographic imagery of Ullstein Verlag's most successful public magazine. With a temporary circulation of almost two million copies, the magazine was the market leader. The BIZ represents the emergence of the new medium of illustrators, who increasingly achieved their impact and audience success through images, influenced viewing habits and served readers' visual desires. Analogue photography is at the centre of the exhibition and the exhibits of the Ullstein Collection bring new perspectives to the viewer's eye: original prints by renowned photographers and agencies such as Zander & Labisch, Georg and Otto Haeckel, Philipp Kester, Martin Munkacsi, Felix H. Man, Erich Salomon, Yva, Max Ehlert and Rosemarie Clausen from ullstein bild's historically grown, unique collection provide insights into the history of photography, the press and the publishing house as well as into the contemporary history of several epochs. Selected issues of the BIZ complement the presentation and show the photographs in the context of their publication. The exhibition leads visitors back to the source of today's flood of modern digital images and offers a wide range of insights into the decision-making processes involved in image editing.